Chances are, you’ve heard something like this before. Just like we’ve all been brainwashed into thinking there’s only one way to give an elevator speech, we’ve had the same thing happen to how we’re supposed to think about leaders. 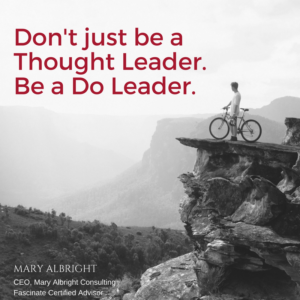 Why are you sought after if you’re a thought leader? Isn’t that a fancy way of saying you have ideas and thoughts? Maybe you’re thinking about things in a new way, but what are you actually “doing?” Are you one of those people who has a thought and someone else is the doer? Why isn’t there more focus on the Do Leader? Lead by doing. Lead by doing with others. Leading by active example and not thinking you’re too good or too big to actually do the work. It reminds me of a story from the Revolutionary War. The short version is a colonial sergeant had a squad of men come across a tree in the road. The sergeant ordered the men to move it. His squad struggled while he stood to the side and barked at them to move the tree. A mounted officer and another squad of men rode up and asked what the problem was. The sergeant said his men were working on it. The officer asked why he wasn’t helping his man. The sergeant said, “I’m their leader. I’m in charge. I ordered them to do it.” The officer dismounted and with his squad, they heaved and moved the tree. When the work was done, the officer mounted his horse and told the sergeant, “Next time your men need help, send for the Commander in Chief.” That mounted officer was General George Washington. When you lead by doing you show the world you’re there to make a difference for something bigger than yourself. It’s a little thing called selfless leadership.